Walk with me as I "Follow the Fish"...JESUS!!! WOW - What a week!!! Our God is SO Good!!! We had GREAT weather all week too!!! At the last minute, H and I were invited to go FREE of charge, except our evening meals and God even provided those for us...H and I got to go on this trip with our family for FREE!!! I knew...it was Gods plan! We had wanted to go all along but couldn't afford for all of us to go...I had said since July that if God wanted us there...he'd provide a way for us to be there...God is SO good!!! We started out the week leaving the day after Christmas on a tour bus for a 22 hour ride to Brownsville, Tx. We DID eventually arrive! Thank you Lord!!! We were looking so forward to being able to see our Mexican friends again...H was excited to see Esli again and as you see...their friendship has continued! We did a prayer walk after we arrived on Wednesday the 27th heading over to the clinic that we helped to build when we were there in July...it was GREAT to see the progress that had been made on it with the windows, electricity and the ceiling. We also paid a visit to the bridge that was built by the Mexican government with funds that Focus on Missions raised the last time that we were there. After seeing the dead dog with no head in the water...I was SO thankful that we gave these people a way to cross other than their old path of walking through that DISGUSTING water! The 28th was H's friend Esli's birthday so we held a birthday party for her...the kids had a lot of fun and really didn't mind us joining in on their games as you'll see. On the 29th, we visited the men's and women's prison...I was quite a bit calmer going in there this time knowing what to look forward to. Focus on Missions has a very good relationship with the prison and we went there and painted the men's chapel the tan color that we had and replaced a worn out roof at the prison entrance...the guys did a GREAT job on the tin...it looks so much better!!! We handed out ministry bags of necessities to the women and children and had a testimonial time...1 women gave her life to the Lord. Every Christmas the mission team plays the guys in the prison at Baseball...it was a GREAT time and I think the prisoners really enjoyed watching it too. We then had a church service in the men's chapel, our friend that we have been praying for since we were there in July found us and immediately came to us and gave us hugs. He's doing really good in there and was so glad to see us again. We met many guys from America and now have a larger prayer list for our prison friends. The service in the men's chapel was my favorite...it was a GREAT time in the Lord and several men gave their lives to Christ during that service. The prison houses about 60 women and TONS of men...about 150 men in the prison are now born again believers and live for the Lord there in the prison...they DEFINATELY are a light in a DARK place!!! This same day we made a trip to Sister Esther's Children's Home. The Children's Home is a home where the kids that have parents in prison can go to...some parents keep their kids with them in the prison until they are 6 years old but then they have to go somewhere else until the parent gets out of prison. Sister Esther's Children's Home is run completely off of donations from people like Focus on Missions. She is a wonderful Christian lady who loves the Lord and those kids so much that she makes sure they go to a Christian school. Please be in prayer for Sister Esther that some more churches will step up to help support these kids...she gets NO funding from the parents as they are in prison and no funding from the government. She runs a tight ship at the home and you can tell as the kids are clean, very well behaved and the home is clean. She is currently in need of funding, as she's behind $7800 in her private school fees...since her kids make up most of the school...this hurts the school also. The school is in the pictures when we hosted a VBS there one night. The kids were so excited to see us and really enjoyed us loving on them and playing with them. Sister Esther is the woman that you'll see with a BIG smile on her face!!! The 30th was a very interesting day for me...we started the day out by going shopping at HEB to get beans and rice for the people who live at the City Dump. In July there was another ministry group there so we didn't get to get out (something that I was thankful for at the time) but this time we got out and ministered to the people, loved on the people and gave the people bags of beans and rice...they were grateful and I was humbled!!! It was sad to see them leave our area when the local trash truck came in. We have so much here in the USA and complain about not getting the latest things...there they have nothing and actually LIVE with the trash...and they were happy with what they had. I think everyone should attend a mission trip to a city dump sometime in their lives! It's a VERY humbling experience! That same night we held a ministry opportunity at the Christian school near the Squatters camp...there were over 404 people there and we only had 200 hotdogs and 300 fruit pies...we never ran out of either one...God is SO good!!! The people had a great time. The Lord revealed many things to me this week but one of them stands out more than others...it's that Mexico is a VERY poor area. Steve Smith with Focus on Missions presents the needs and we pray about them and give as we can...sometimes it seems that he's presenting need, after need, after need...it's because there are TRULY that many needs. How Great is Our God!?! Even after this past year of what seemed to be miracle after miracle in the financial realm for our family...I know our God is even GREATER than that!!! He's a GREAT God and I hope I never get to a place where I don't realize his goodness!!! While I'm glad and thankful to be home...my Mexican friends hold a special place in my heart and I long for the time that I can see them all again!!! M and H had a GREAT time and both met new friends...we're looking forward to going back so we're beginning to pray for the Lord to provide the way and to show us when we should go. We also became very close to the other groups that joined our group and we're looking forward to making a trip to Louisiana...God willing we'll see our Louisiana friends sometime in the near future! Enjoy the pictures as there aren't as many as in July...only about 250 this time! Thank you for your prayers for us...they worked!!! We love you all!!! God bless you!!! I wasn't allowed to take my camera in the prison but Steve Smith was able to take his...here's a link to the Prison pictures. We were blessed to be able to go on another mission trip with JOY FM the Christian radio station in St. Louis again this year. Larry, Heather and I went to Trinidad (Michael went to Mexico in June). Trinidad is 7 miles north of Venezuela and is considered a Caribbean Island. Their primary religions there are Muslim, Hindu and Christian. 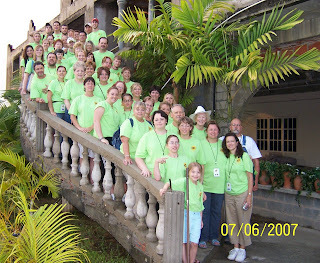 There were 50 of us who went and Heather found her long lost sister - Hadassah in Trinidad. It's a place I would love to go back to...the people are so lost! I have never seen an "idol god" before...wow - this island has some MAJOR darkness! We ministered to so many different people and kids...Larry was sick most of the time from the dust and mold in the stage that our team replaced but he made it through. So I was on Pinterest when it very first rolled out on the WWW...I couldn't for the life of me figure out what all the fuss would be about it so I chucked it aside and didn't really give it another thought...until recently that is. My son's girlfriend was over one night and we were chatting and she was talking "all things Pinterest"...I told her that I just "didn't" get it...what's the deal/big deal with it!?! She logged in and took me into her account and I got to "See" for myself what the fuss was about...that night I made an account and pinned over a couple hundred pins...it was fun! So if you're like me and trying to figure out...what's the deal with Pinterest let me try to explain it a bit and then tell you some Pinterest things that I'm happy I've found. This Evil World - or Is it?? ?